A significant change in our holiday habits started in the 'sixties with the growth of caravanning and camping holidays as an alternative to the traditional boarding house or hotel. This type of holiday gave people freedom from the restrictions often still imposed on boarding house guests. They could make considerable savings as well. Camping holidays began before the twentieth century. The first true holiday camp was the Cunningham Camp on the Isle of Man, which opened in 1894. All the campers were men. They stayed under canvas and helped with the chores of the day-to-day running of the camp. Many camps on this model were run in the 'twenties and 'thirties. The obsession of the time for healthy outdoor life added to the popularity of camping. This type of camp became known as a pioneer camp. The philosophy behind the organisation of this style of holiday camp was very different from the commercial spirit behind Butlin's and other such camps, which were run for a profit. Even so, the campers were still organised to some extent. They were not truly independent. Camping holidays in the 'sixties were very different. The campers brought their own tents independently - usually on the roof of their cars and made private arrangements with a local campsite. The most popular destination was the West Country. The trip was made easier when the M5 bypassed Bristol in the late 'sixties. This is what most people think of a camping holiday today as being like. My parents went camping in the 'seventies. Sometimes a trailer was taken - sometimes the tent was packed on the car roof rack. My Father's Austin 1800s made light of the trip. My best memories of camping are from a two-week holiday in the New Forest in 1976. It was glorious - temperatures soared and rain was banished forever. It wasn't all fun and games, however! I remember one holiday in Cornwall when we had to tie the tent down with extra ropes to stop it from blowing away. Our campsite neighbour's tent actually did blow away! Caravan holidays in that era are of two distinct types. 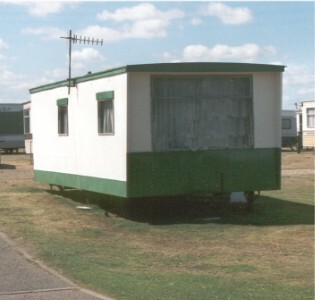 There were caravan sites with large permanent caravans and sites for touring caravans pulled by a car. Statistics produced for Devon County Council show that the number of static caravans rose steadily in the late 'fifties, but peaked in 1963. They actually started to decline in number in the mid 'seventies. Camping holidays in tents are very weather dependent and statistics vary widely. There are those hardy campers who will go come rain or shine and fair weather campers - not surprisingly these figures show 1976 as being the best year! However, touring caravans rose steadily in number throughout the 'sixties and sharply in the early 'seventies. The growth in the numbers of touring caravans was due in part to one man - Sam Alper. His Company, Caravans International (CI), pioneered the cheap and cheerful Sprite range of caravans, which began in the early nineteen fifties. 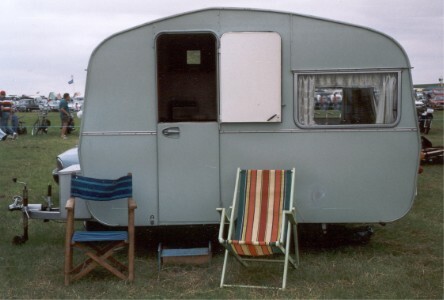 The model which took the world by storm was the Sprite Alpine, launched in 1965, and which became the best selling touring caravan of all time. Sprites were cheap, but well built and extremely popular. CI dominated the market in the 'sixties taking over many established names. CI faired less well in the 'seventies. Strong competition almost forced it out of business at the end of the decade.